Versatile little thingies aren't they? It's the over-engineered switch stand with a hole drilled in the side of it for the fuel hose. I'll eventually get round to making some of your style of switch stand for Grande, there's enough pointwork here to make them noticeable. Once there were mountains on mountains and once there were sunbirds to soar with and once I could never be down. It has been a while since I updated this thread. 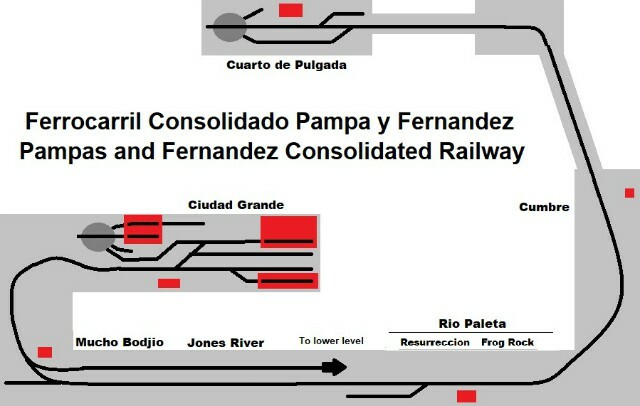 The FCPyF is now fully connected and through running to/from Grande is possible from both the San Fernandez and Cuarto de Pulgada lines. The staging yard at Centrales has been replaced with a new junction and a new section of baseboard bridges the gap between there and Grande. The level area on the new section of layout will be a small town with the buildings acting as a view block for the scenic break between the junction and Grande. An update from Sierra Oculta. Work around Bodjio is on hold while the glue dries on the ballast and weeds so I've diverted my attention to the other end of the garage where the line crosses the doorway to the garden. The existing station at Cumbre has been removed, to be replaced with a new rail/ferry interchange called Lago Cumbre (Summit Lake) on the section which was previously hidden from view. 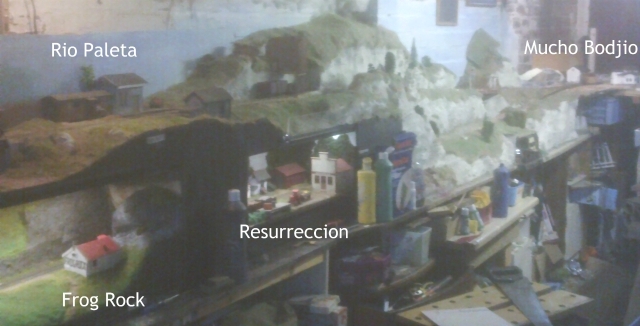 The painted mountains screen has been relocated behind the line to act as a backscene. The water tower from Cumbre is now at Grande and the tower from there has been returned to Rio Paleta. When originally here it cast a shadow on the backscene so its new location is on the near side of the line to prevent this. 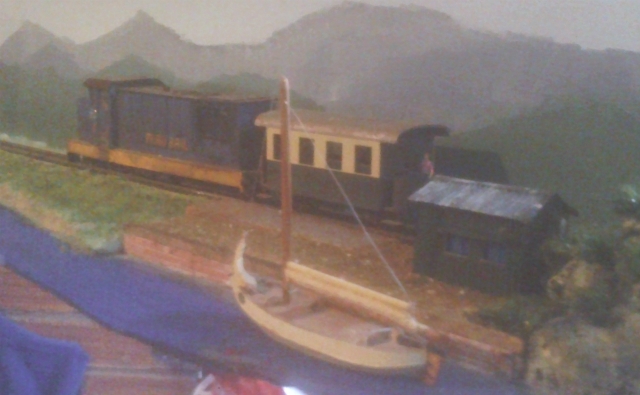 Structure gauging was done using the big blue diesel and Fleischmann coach as these are both slightly larger than the Bachmann trains. I'd be the first to admit that the photos in my recent posts have been less than perfect. 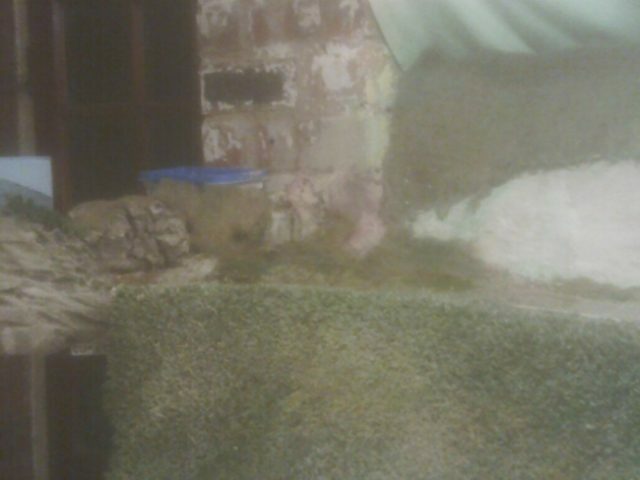 This is due to the use of a cheap camera but I've found an old mobile phone at home and it takes much better pictures. A new slideshow of the route from Grande to Cuarto and back is shown on the link below. Intermediate locations, outward bound in line order, are Bodjio, Jones River Bridges, Lone Pine Rock, Rio Paleta (mine, station and bridge) Cumbre MoW Halt and Lago Cumbre. It's coming home... Not the World Cup, come on, we all knew we were going to get knocked out sooner or later! What's coming home is last night's Cuarto to Grande passenger train, filled with disappointed football fans who had made the trip to Cuarto to listen to the match, because it's the nearest the railway gets to the radio in the kitchen. The FCPyF procurement department has just acquired a second consolidation for use on the steeply graded section between Grande and Cuarto de Pulgada. This will allow the two moguls (7 and 42) to work through trains from San Fernandez to Cuarto de Pulgada as far as Grande where the trains reverse, the consolidations (33 and 117) taking the trains from there to Cuarto. 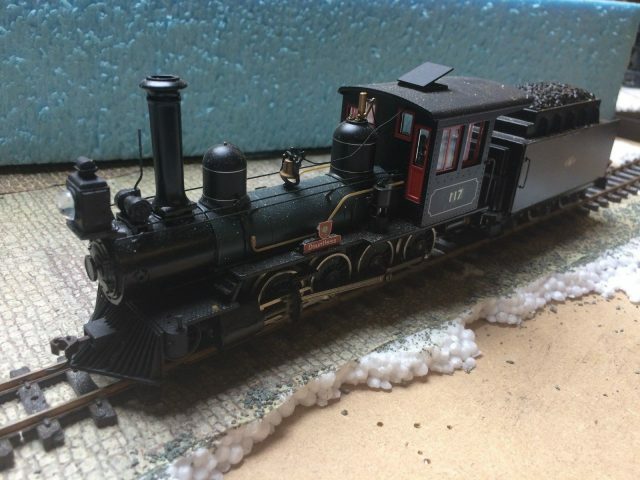 The new loco has a three axle tender drive unit, this will probably be replaced with an Athearn SW chassis and the tender extended to accommodate. The new consolidation arrived yesterday. As suspected the pick up is loco one side, tender 't other. In addition to which the mechanism had come loose inside the tender in transit so it was disassembled and the body hacked to resemble the front half of a Vanderbilt tender. I had intended to use a cut down HO scale cylindrical grain hopper for the rear of the tender but it is too wide to fit inside the square body section. Plan B involves an empty acrylic paint bottle and a lot of modelling putty... More to follow. I read on your website that you have problems with this type of pickup arrangement. Whilst your layout is dismantled you might want to consider replacing one of the insulating fishplates at the with a normal one at your isolation point between controllers. This will give you one common rail at this section, but both controllers would still be independent of each other. 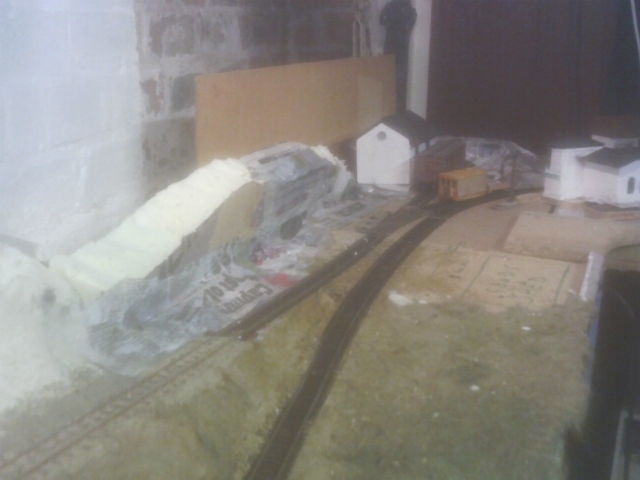 The layout isn't dismantled as such, it's not designed to be portable, just the two lift out bridges over the doorways were down and one of them is now back in place. The electrical gap doesn't have insulated fishplates. It is just a gap so easily shorted with a blob of solder. I've just tried it, the test train was a Lima DMU. Before the rails were soldered the train stopped (as expected) at the gapped rail join. With one gap shorted out I first tried the controllers in opposite directions, they were still independent of each other so no problem there. However, the train still stopped at the changeover point even with only one rail gapped. The experiment didn't work, but it did give spectacle of a BR 101 operating in south America! 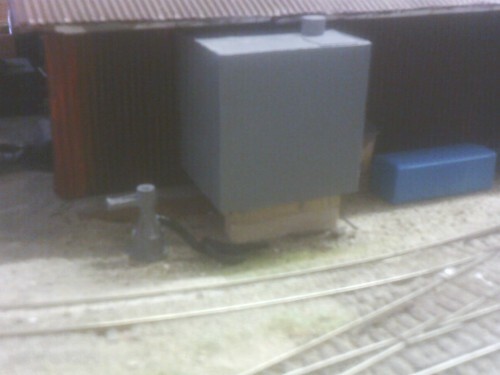 I've rewired the loco shed area at Grande recently, and managed to get the polarity wrong. If it's worth doing it's worth bodging! 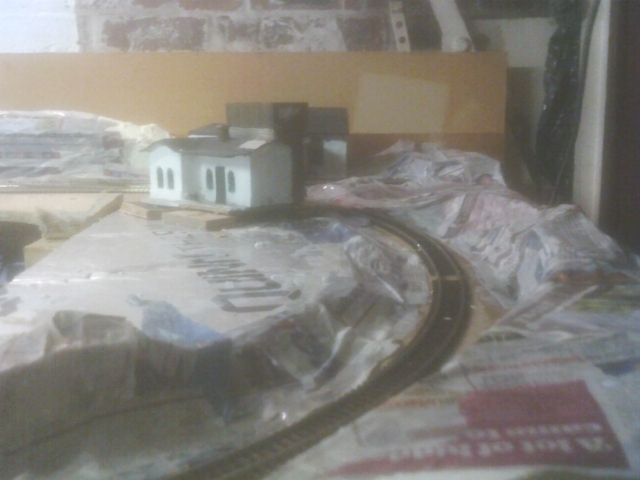 Anyways, at least I can play trains properly now instead of having to push them in and out of the shed. 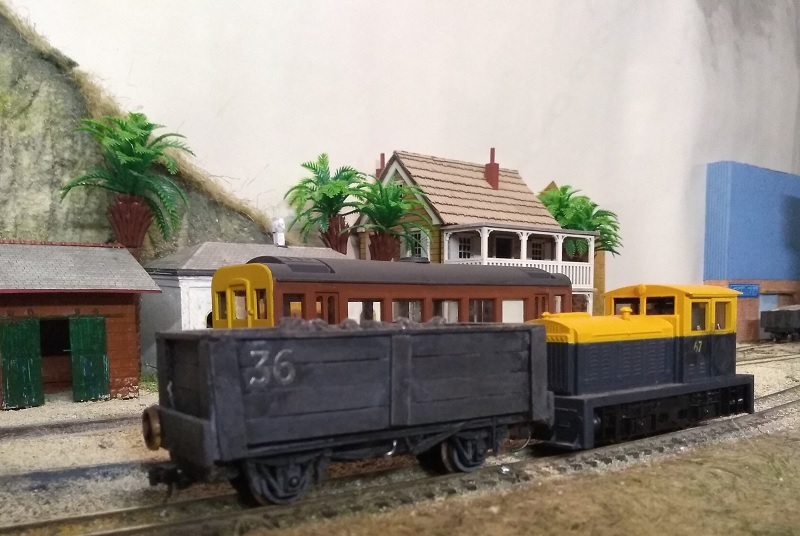 Another problem has become apparent, the sprung collection shoes under number 10 keep catching on the gap as the loco uses the short spur next to the shed. I've sent 10 to Cuarto where the turntable doesn't have such gaps (because it's better made than the hurried "temporary" job at Grande). 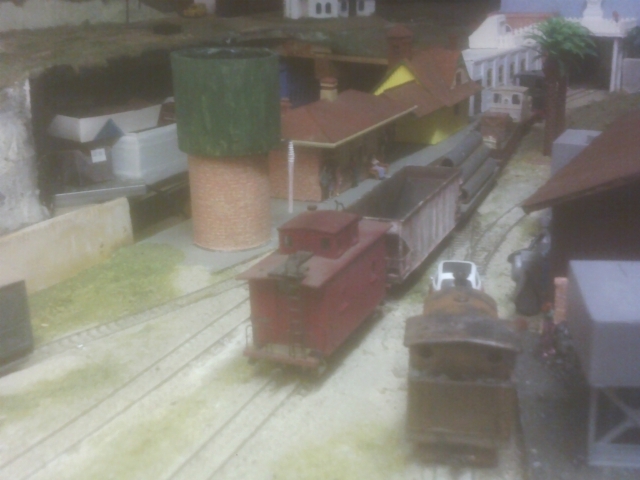 Boxcab 18 is filling in as shunter at Grande and the Plymouth DDT from Cuarto is awaiting renmbering. 6677 is a bit odd when the rest of the railway's loco fleet only carry one or two digit numbers. It'll probably end up as 67 depending upon how easy it is to erase the existing outer numbers without damaging the paintwork. I've figured out the correct combination of turntable DPDT and controller direction settings. It doesn't half confuse the brain when half the tracks are wired the wrong way, anyhow it is working so I can get on with the serious business of playing trains. 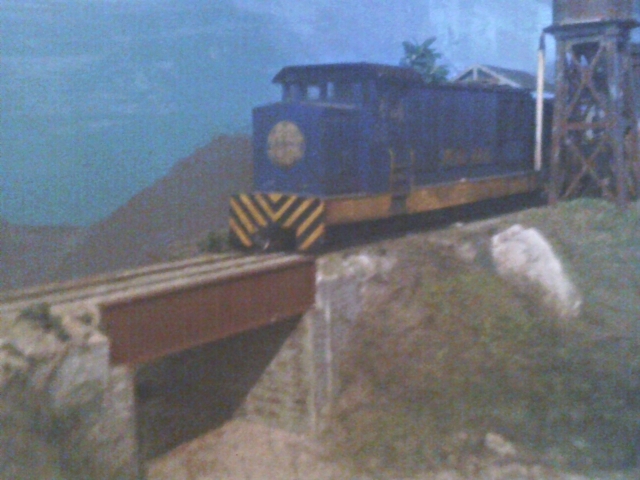 More playing trains, this time a freight extra collecting loads from the mine at Rio Paleta. I spy a new 4-wheeled hopper, or have I missed this in previous posts? The four wheeler's been around for quite a while, flitting between the FCPyF and various Gn15 layouts. It just seems camera shy. 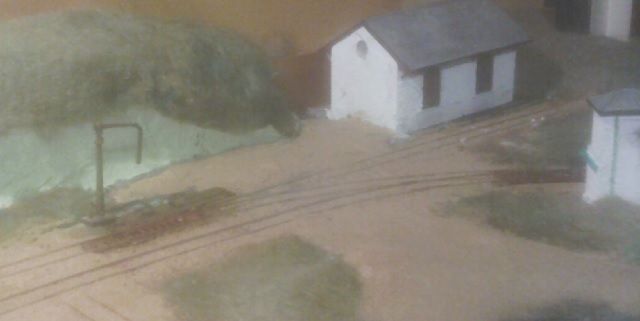 I've been operating the layout again this afternoon and made a mental note to get round to re-wheeling the two axle hopper. It's still on its original running gear and dog-rough in places where the ballast and/or weeds cover the sleepers. 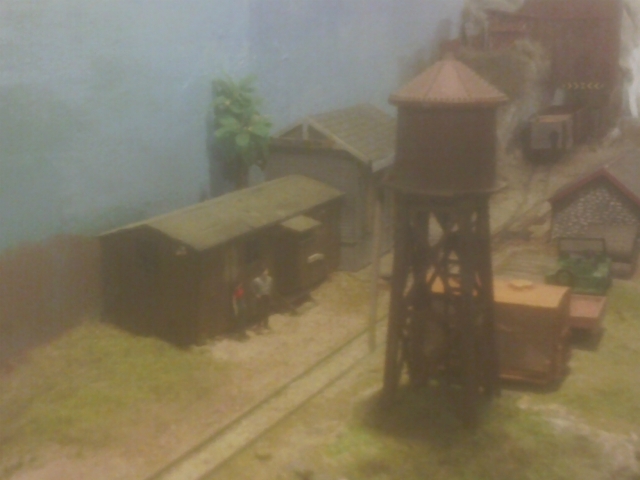 Like the work at the mine, as shown in your blog, Bob. Extending the shelf the siding runs on really shows off how much the main line drops away. Depending where the cracks in the clay rock-face appear, I'd consider leaving them - just add some vegetation growing out of the fissures.